Barbara Hannigan is the Empress of Lied, of contemporary Opera; certainly she is royalty among contemporary orchestral conductors, and she is first among musicians who can write, re-imagine, act and dance en-pointe. Want more? She rules from the musical stage as women (and men) many more times her age. In short, you simply cannot take your eyes off her, nor take your mind off what she is dishing out to you. However, lest I be accused of being open-mouthed and hopelessly breathless throughout the two hours of heady music, I must add that last night’s performance was a master class in the re-imagination of Lieder from the Second Viennese School of Arnold Schönberg, Alban Berg, Anton Webern, Alexander Zemlinsky, Alma Mahler and Hugo Wolf. 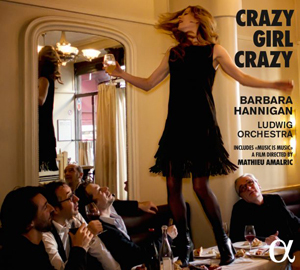 All great singers – and Barbara Hannigan is indubitably one of them – get into character once performing on stage. But none conveys who they are or what the song means to them as (and in) that specific persona with the kind of visceral energy as Miss Hannigan. Song after song she announces her arrival as a performer with preternatural abilities. There seems no one who brings such complexity and sophistication to this salon genre as Barbara Hannigan. She seems to live with the songs she performs in that dramatic and beautiful, floating and swooping soprano that she possesses. Her “Vier Lieder” from Schönberg was highly introspective as the songs seemed to speak to her in a very personal way – most remarkably in the complex gender-bending role she chose to play on “Schenik mir deinen goldenen Kamm”. Time and time again Miss Hannigan confirmed her powerful grasp of Lieder poetry – including the Lied of Johann Wolfgang von Goethe, Heinrich Heine, Richard Fedor Dehmel, Rainer Maria Rilke, Johannes Schlaf and others from the Age of Enlightenment. In her mystique and majesty, Barbara Hannigan was able to spin a web-like Utopia into which we were beckoned not as prisoners, but as willing co-conspirators following her into a rarefied realm of imagination and extreme emotion; one in which every psychological insight into Romantic human being was revealed with the utter lyricism that becomes only someone who has not only dramatic, but real insights into the humanity that she was singing about. Something else was revealed at Barbara Hannigan’s November 10th recital and it is this: Reinbert de Leeuw was no mere star-struck spectator on the stage but a protagonist in his own right. Throughout the night he showed why he was ever-present, as he conveyed a pianistic poetry in a very detailed performance where every nuance and subtlety seemed carefully pondered, but without a hint of contrivance. He was a pianist who knew perfectly when to step into the limelight and when to withdraw into the shadows. It was a truly special, memorable night spent with a great singer, who knows instinctively how to strike the right balance between characterisation and vocal beauty. Together Barbara Hannigan and Reinbert de Leeuw crowned their artistry with interpretative styles that ranged between those who let the music alone bring out the meaning as well as who dramatise the songs to an extreme extent.